As a World War II history buff that’s seen the 2009 Quentin Tarantino film Inglourious Basterds, I would describe the plot of the film as highly entertaining, but not quite historically accurate. With that said, Inglourious Basterds is the only place to see the obscure but very real, Sedgley OSS .38 glove pistol in action. If you’ve seen the movie, Sedgley glove guns are used by Sergeant Donowitz and Private Omar to kill the two SS men guarding Hitler and Goebbels’ private box at the cinema. For those of you who haven’t seen the movie, that last sentence probably left you scratching your head. 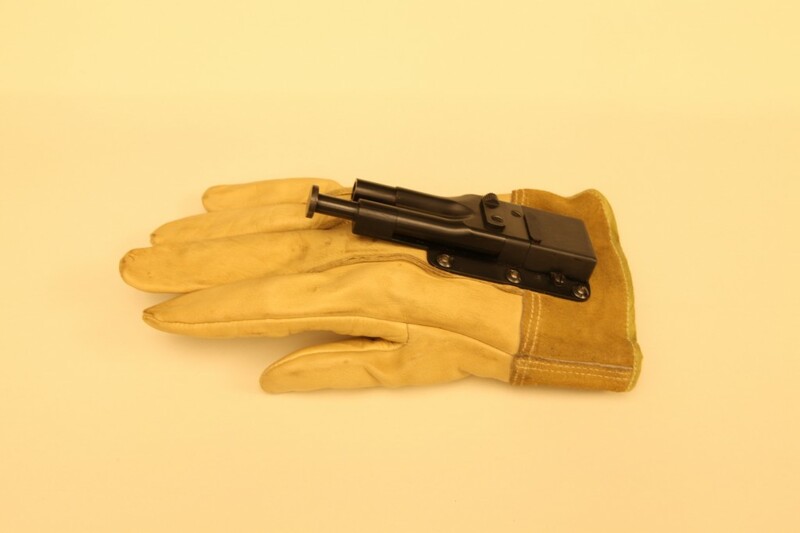 The glove gun was designed by the Office of Naval Intelligence and manufactured by the Sedgley Company of Philadelphia, and used by the Office of Strategic Services (OSS). The weapon was designated as an assassination pistol, and consists of a heavy cowhide glove with a single shot .38 pistol attached to the glove. The weapon is activated by making a fist and punching the intended target, and upon contact, a plunger-like trigger fires the .38 bullet into the target at point-blank range, eliminating the possibility of missing the target. The glove gun in the Museum’s collection was donated by Robert Ramirez, whose father-in-law, Lawrence Nye Hanna, was a naval officer with Beach Jumper Unit 7. Beach Jumpers were highly specialized units whose job was to simulate amphibious landings, designed to lure and divert enemy attention away from the actual landing beaches miles away. The Beach Jumpers were the brain child of Hollywood actor and Navy Reserve Officer Douglas Fairbanks, Jr. who had witnessed similar tactics employed by British Commandos while on assignment with Lord Louis Mountbatten’s staff in England. Hanna was issued the glove gun with the instructions that it be used in the event that his boat was boarded by the enemy. With his hands raised above his head in surrender, the enemy would not be able to see that the glove was a weapon. If the enemy came in range, Hanna was to strike them in the head. Luckily for the enemy, Hanna’s boat was never boarded.